Create your own personalized cover for your Kindle with one of these great tutorials we have gathered for you. Some of these tutorials use fabrics, real books, and other creative techniques to create some really interesting Kindle cover designs. Take out your scissors, glue gun, sewing machine and go buy your favorite fabric. It's time to get started on your project. This homemade Kindle cover from Come Together Kids is made from a real hardcover book and features a handy storage pocket. You will need fabric, adhesive tape, a glue gun and an iron. 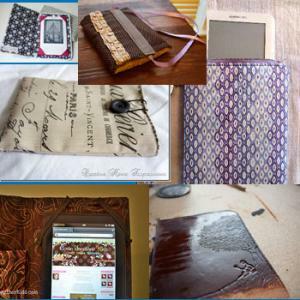 This Kindle case tutorial comes to us from Mommy by day Crafter. I really love how they use hair elastics to hold the Kindle in place. Some of the supplies you will need include velcro, fusible fleece, fabric and hair elastics. Here is a simple DIY Kindle cover design using only fabric. There are actually 3 various types of fabrics used on this project. This one comes to us from NEO [phile]. I think you may need a cat for this one. All right ladies, this one is for you. This one may require some sewing skills, but I'm sure you will love the results. Some of the materials required are fabric scraps, a velvet ribbon, and D-Rings. This design and tutorial is from Charm Stitch. This tutorial is really impressive. It looks really professional and it includes a handy stand. Wrapped up in Rainbows really did a fantastic job with this one. You will need some cardboard, scrap fabric, a glue gun and a long peace of elastic. This one is more of a sleeve than a cover, but yet a very beautiful and simplistic design. You will need some fabric, elastic, and a button for this one. This tutorial comes to us from Creative Home Expressions. This tutorial is very detailed and shows you how to make a a simple padded case with a zipper and strap. Some of the materials you will need are fabric, 1 zipper, 1 D-Ring. This handy tutorial is from Around the Bobbin. Here is one fun Kindle case tutorial by Ellison Lone Quilts. The measurements fit a Kindle touch but you can adjust the case to fit any size eReader. All you have to do is add 1.5" to the length and width of the fabric. Some of the materials you will need are a few peaces of fabric, velcro and fabric glue stick. This one is not for the faint of heart, but it has to be one of the best tutorials so far. While most tutorials show you how to make one out of fabric, this one takes it to the next level. The cost of materials may be a little higher, but your case will definitely stand out from the rest. This tutorial comes to us from High on Glue. Here is another simple tutorial of a Kindle case with a zipper. This tutorial is by Dixie Mango, and the instructions are real easy to follow. You will need a few peaces of fabric and a 12" zipper. We hope you enjoyed this great list of Kindle tutorials. Please share your thoughts, let us know which one is your favorite! I know this is an old post, but I just couldn't let this pass without commenting. I am so tired of seeing people making comments about another poster's spelling, while they have glaring grammatical errors in their own posts. It just made me "cringe" that you did not encase "however" in commas, as it is an interrupter in this instance, and instead chose to put one unnecessarily before "that." Next: "Spelling is important, it really is." This is a run-on sentence and requires a period, as there are two independent clauses. You're right. Spelling is important. Grammar and punctuation are also important as well. Kindness is the best choice, however.